Phyllo is an amazing, flakey pastry used in Greek desserts. Because they are stretched so thin, they aren’t the easiest to make so it’s a great thing us lazy Americans can go to the store and buy them in the frozen food section. In the form of sheets or already shaped into cups these are great to have on hand to make a quick dessert or appetizer. Below is my favorite app my mom makes sure to have at any big family dinner she has. The warmed up cheese, topped with a sweet jam (apricot and raspberry are my favorite) and crispy shell, this is a wonderfully flavorful bite. 1. Lay phyllo cups on parchment paper lined cookie sheet. Drop a ½ inch square of brie into each cup. 2. Bake at 350⁰ for 20 minutes or until the whitest part of cheese is melted completely. 3. 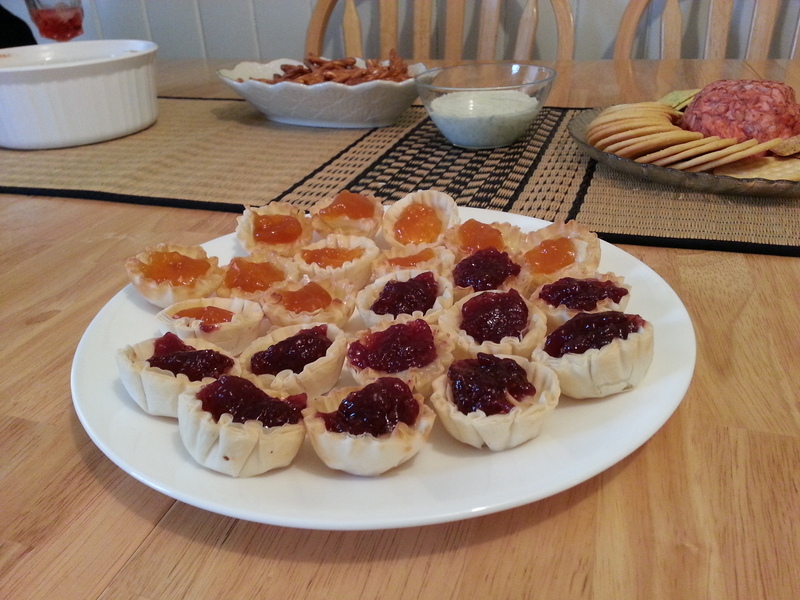 As soon as melted take out of the oven and drop ½ teaspoon of jelly or jam onto each phyllo cup. These look delicious – one of my favorite sandwich shops make a fig jam and brie panini, so this reminds me of it. I’m going to have to look for those phyllo cups at the store!